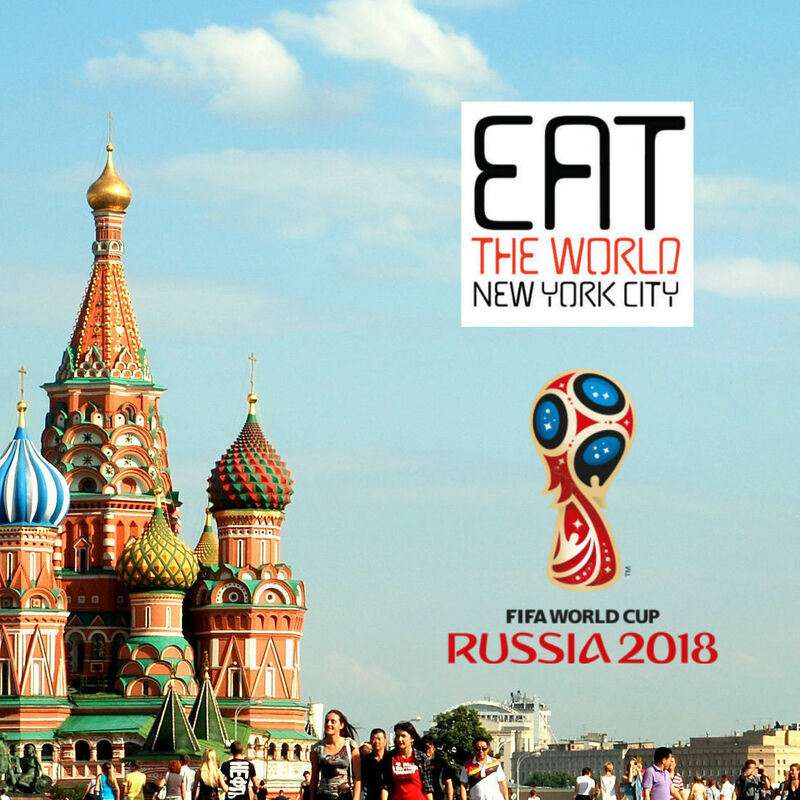 The state of Puebla seems to be the home of a vast majority of Mexican immigrants to New York, and this shop is owned by some that call small Piaxtla home. This municipality in Puebla state is enough for them to declare as their name "Piaxtla is Mexico." Since I first came here in 2008, this fun place has expanded from a small dining room with a couple tables to much more. It has added outdoor seating and bought out the next door neighbor to expand into a second room. What has not changed in all this time is their incessant use of neon green. It is not as grimy as it was back then, and service has gotten efficient, without quality suffering. I do miss the specials menu that was printed by hand on paper plates, but you can't have everything. You can however have it at any time, as they are now open 24 hours a day. 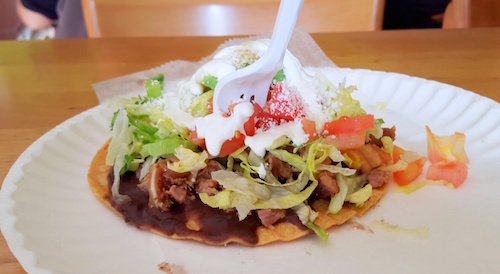 I remembered their tostadas being excellent, so I ordered one with suadero ($3, above). They still have a good combination of ingredients and a nice base of bean to lay the meat on. Al pastor is the meat item at the top of the choices, and as per my new theory I made sure to order it on two taquitos ($1.50 each, below). 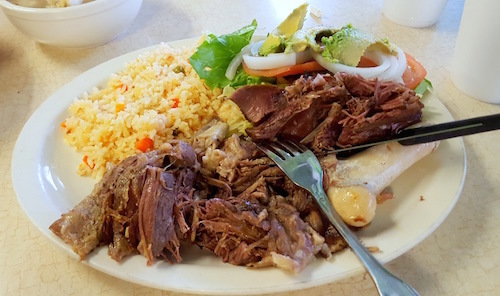 They do not have a trompo here so the meat is made differently than usual, but it is indeed delicious, juicy and tender. 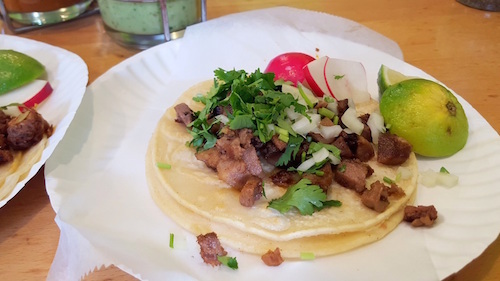 Their larger tacos are called especiales, and I decided to take one with lengua ($3, below). This tongue was not one of my favorites, very soft and with more "special" flavor than I care for. Unless you just prefer larger tacos, I do not see a point in ordering one of these rather than two small ones. The place still has it, and has probably even improved over the years while its popularity has risen. You will see the tables filled with Mexicans at almost all times a day. 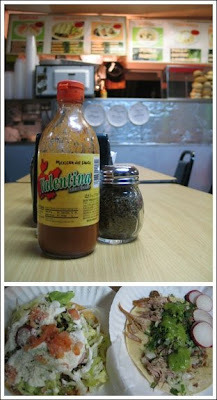 They do serve breakfast items as well as weekend birria ($12, below) which I returned for on a recent Sunday. On the menu, it actually reads "barbacoa-birria" and when I was served she simply said "barbacoa" when placing the dish above in front of me. 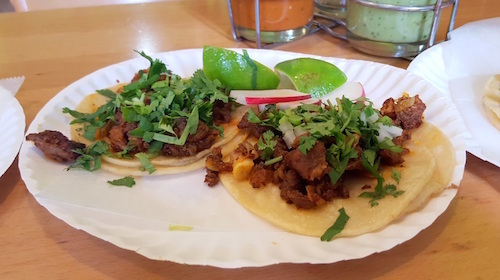 Once again, my dreams of east coast birria were thwarted, we still live in a city that does not produce a real version of it, except maybe in the home of a good cooking Tapatio. That being said, their barbacoa plate is very tasty! Chunks of fatty tender goat meat speak for themselves and really need no addition. They also make a solid pozole ($5, below) seen in small version and also available larger for $8. 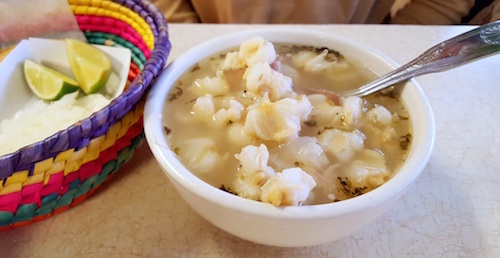 As all pozole should be, this bowl is completely customizable with their on table shakers of celery salt and red pepper and the basket of hard tortillas, limes, and onions they bring.